So a new friend of mine came around to get his brand new browning x bolt hells canyon speed set up today. Once we got it zeroed and some velocity readings we shot a few groups with the factory muzzle brake and a stealth suppressor. First off the rifle is nice topped off with a nightforce shv 5-20. After shooting my first group (Sam) with the suppressor I swapped out his Harris with my Harris with spikes so I could load the bipod. That may account for the difference in poi of 1” between my 2 groups and his as both were shot with my Harris. The spikes made a difference as I’m used to loading the bipod and his rubber feet slipped forward. Interestingly both our groups were of similar size. Ammo used was factory Norma with Barnes 140tsx. The Velocities recorded was 3160 to 3295. 3 shot groups had 65-109 FPS Es. The spreads were higher with the suppressor than the brake. Overall the rifle shot nice. Apart from the heavy trigger, but it was still crisp. The recoil pad is super soft, and recoil was tamer and more comfortable than the std tikka t3’s I’ve shot. The rifle was surprisingly light even with the nightforce. We’re going to do a hand load for it so I will be interested to see how it will shoot with some better ammo. gadgetman, JoshC, Bernie and 3 others like this. Not many factory rifles come out with a 26 inch barrel but it certainly makes a difference in performance for the 7mm rem mag. The longer barrel balances the rifle better and makes it easier to shoot well free hand Imo. Yep, it was very well balanced. It was good to see and shoot one as I’ve never seen one in the stores. Great barrel contour. The flutes are so shallow though I don’t even know they are necessary. The only down side was the muzzle thread at 13x1, not very common. I would love to see one of these in the McMillan stock. The only down side was the muzzle thread at 13x1, not very common. veitnamcam, 199p, gadgetman and 15 others like this. That's some average grouping there champ, you related to philipo buy chance? The 13 X1.25 can be modified to 1/2-20. Otherwise ,it gets the chop and get rethreaded to a more common 14x1 or 9/16-24. The hell canyon speed got a fatter barrel and a standard 5/8-24. The factory break is there almost for decoration. There is a version with a McMillan stock available in the U.S.
Or - you can buy a stock directly from McMillan - but will need someone with an import license. I've got an X-Bolt SS in 7mm-08 with a McMillan stock listed on Trade me if anyone is interested. 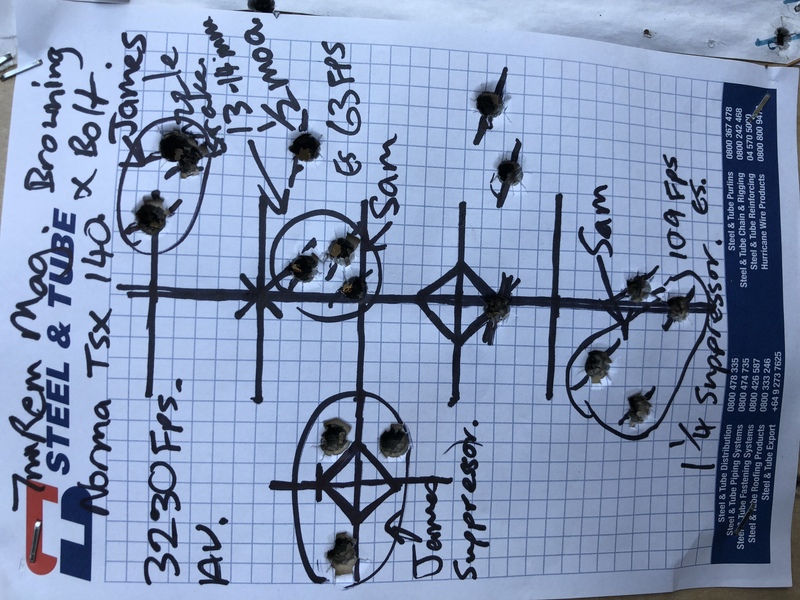 @Creeper if you read the Es beside the group you will see that the extreme spread of the ammo was very average, 63fps and jameses one was 70fps Yet the rifle still managed a 13mm 1/2 moa group with the muzzle brake. I think the results were pretty good. For some reason the velocity spread was high with the suppressor and the groups were bigger. I did shoot 15 rounds with my 338 and 300 and had single digit Es wit my hand loads so there was no problem with the cronogragh. Greg I’ll let him know you have that thread. veitnamcam, Kiwi Greg and Bernie like this. madmaori, PERRISCICABA, Boaraxa and 3 others like this. The Hells Canyon McMillan in 28 nosler looks to be nice with a 1:8 26” barrel, but would it fit the 195gr bergers in the magazine probably not? Seems like a waste to do everything and not the magazine length to get the most out of it. Browning is actually tightening its barrel twist on some calibres for 2018 to accomodate the high bc bullets available now days. I’ve just got it back, I’ll adjust the trigger and do a load up with some 2217 and 162 eldx and see how it likes it. Finally got a quick bit of load development done. 162 eldx. I pulled no 2 shot a little. Did 8 round ladder. Node tested at a flat spot. Es 12 SD 5.3 velocity av 2905 FPS. 6XC with 105's. What speed?